The predominant forest harvesting method used in northern Europe is cut-to-length logging (CTL). 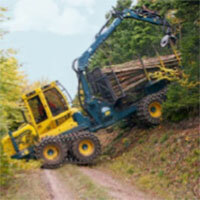 CTL is based on a two machine solution – a harvester is used for felling, delimbing and bucking trees and a forwarder carries the logs from the harvesting area to a roadside loading area where they can be picked up by a truck. These are both off-road machines with a frame mounted crane that operate in areas not accessible by conventional wheeled vehicles at low speed. In order to stay competitive, the Swedish logging industry needs to increase productivity by 2% to 3% per year.